To Shred Here or Over There? Deciding weather your base of operation should avail for off-site or on-site shredding, there are a few key points to consider. The difference with off-site shredding than on-site is that material is transported in locked bags, usually in locked containers, to our secure shredding facility. On-site shredding or mobile shredding, our truck comes to you, and the paper is shredded right there on the premises. Comparing the two methods: Which one is more secure? 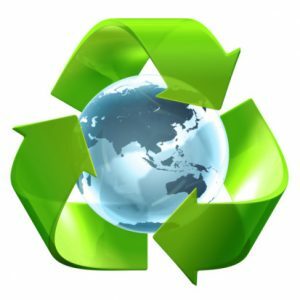 What is the most environmentally friendly choice? What does each cost? What’s right for my business? All good questions, which hopefully we will shed some light on for you. Most importantly when choosing one of the two, the decision should and must be yours. The vendor will provide the best information regarding which process to choose. You know the business and which method suits you more. Data protection is vital for business success and reputation. Data breaches can and will occur if businesses and organisations do not protect their data adequately. Our on-site and off-site shredding services are completely secure. 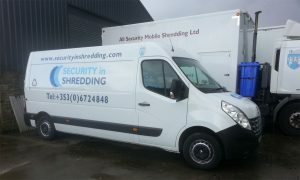 Our mobile Shredding unit is specially designed to handle and destroy your documents securely and confidentially on-site. Our off-site shredding is also done securely and all data is handled by or trained and screened staff. Both methods are done securely where on-site will give you the added bonus of physically seeing your documents destroyed, giving you great piece of mind. The quantity of material to be shredded. All our shredding services, we provide a certificate of destruction once the destruction process has being complete. Off-site shredding, is same day shred to ensure your data is protected at all times. Off-site shredding might be a better option for other customers. When a company has a high volume of information to shred, a mobile shredder may be too time-consuming or too small to complete the job all at once. This is especially true when purging numerous boxes of archived records. Choosing one of our shredding services will help benefit the environment. There is a greater pressure from EPA & Local Authorities etc, to issue reports to them. It is more than just document shredding, you are also benefiting the environment when choosing Security in shredding. This entry was posted in Data Destruction, Off Site Shredding, Onsite Shredding and tagged Offsite Shredding, Onsite Shredding, paper shredding service, secure document destruction by Security in Shredding. Bookmark the permalink.